I have to say it’s been a bit hard to be back from vacation. The constant barrage of awful news this week, whether it’s Mother Nature related or politics and then having received some not good news at work (meaning, I’m now on a job hunt), it all makes me want to get on a plane and head back to Germany & Sweden. While I can’t do that, I will work on my pictures from our vacation this weekend so I can put together a photo album, and I’ll try to recapture that feeling of freedom, peace and joy that I felt while we traveled. I hope you don’t mind if I share some of the pictures with you. After a day in Gothenburg we drove towards the west coast of Sweden and our first stop was the Nordic Watercolour Museum. The building was beautiful and the exhibits we saw were really nice as well. 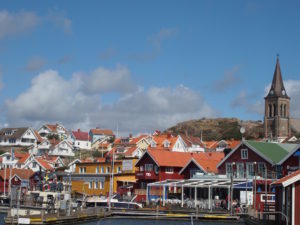 One of my favorite parts of Sweden was the West Coast, known as Bohuslän. There are many quaint and charming fishing villages that make up this area. 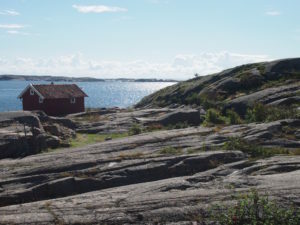 We had a cottage in Lysekil and from there we visited Smögen and Fjällbacka, which has been made famous as it’s the setting for Camilla Läckberg’s crime novels. We had yummy fish & chips, indulged every day in the wonderful Swedish tradition of Fika, “a relaxing coffee and cake break”. You know I was up for that one. And, we took lots of pictures of the beautiful scenery, walked a lot and felt energized by the fresh, cool air. I loved seeing the grey granite cliffs and hearing the sound of seagulls as we walked around. We spent four days in the coast before moving on to Stockholm to visit our friends. If I were to go to Sweden again I would definitely visit this area. So, I hope you all have a wonderful weekend. For those of you in any paths of hurricanes and affected by earthquakes and just any other disaster, I wish you and your loved ones the best. Sending love and light everywhere. I think we could all use a little vacation from the bad news right? And, I promise I will talk about books soon! P.S. – Yes, that’s me with the most delicious danish ever. 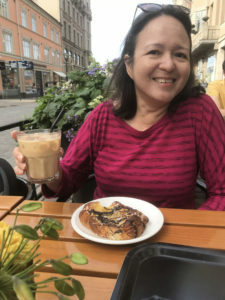 That was actually taken in Malmo but I had something just as delicious every day we were there. Thank goodness for all that walking. I’m so sorry to hear you may be looking for a new job! That’s always so unsettling! I can imagine why you want to return to Sweden and Germany. Great pictures! Looks like you had a fabulous time. Yummy food! Hang in there! Thank you for sharing the photos, Iliana. Sounds like a wonderful time! I am so sorry for all you are going through right now. I am thinking of you and sending positive vibes your way. I’m glad you’d a wonderful vacation, Iliana! Germany & Sweden sound like a lovely place to visit and I wish I’ve the opportunity to visit these places some day. It’s sad to hear all the bad news lately, be it Mother Nature or political issues. Sending good wishes for your job hunting! 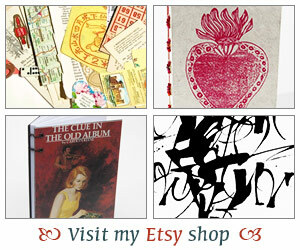 Lovely holiday news and photos! Malmo is always going to be about The Bridge/Bron now, for me, straight from TV. I feel like I’ve heard Saga answer her phone or introduce herself so many times that I should have tasted a pastry from there by now. Why isn’t she evre filmed eating something that delicious? Oh, never mind: detectives have to take the pastries they can get close to hand, I suppose.